Force, Lynch and Conery proposed the duplication-degeneration-complementation (DDC) model in which partitioning of ancestral functions (subfunctionalization) and acquisition of novel functions (neofunctionalization) were the two primary mechanisms for the retention of duplicated genes. The DDC model was tested by analyzing the transcriptional induction of the duplicated fatty acid-binding protein (fabp) genes by clofibrate in zebrafish. Clofibrate is a specific ligand of the peroxisome proliferator-activated receptor (PPAR); it activates PPAR which then binds to a peroxisome proliferator response element (PPRE) to induce the transcriptional initiation of genes primarily involved in lipid homeostasis. Zebrafish was chosen as our model organism as it has many duplicated genes owing to a whole genome duplication (WGD) event that occurred ~230-400 million years ago in the teleost fish lineage. We assayed the steady-state levels of fabp mRNA and heterogeneous nuclear RNA (hnRNA) transcripts in liver, intestine, muscle, brain and heart for four sets of duplicated fabp genes, fabp1a/fabp1b.1/fabp1b.2, fabp7a/fabp7b, fabp10a/fabp10b and fabp11a/fabp11b in zebrafish fed different concentrations of clofibrate. Electron microscopy showed an increase in the number of peroxisomes and mitochondria in liver and heart, respectively, in zebrafish fed clofibrate. Clofibrate also increased the steady-state level of acox1 mRNA and hnRNA transcripts in different tissues, a gene with a functional PPRE. These results demonstrate that zebrafish is responsive to clofibrate, unlike some other fishes. The levels of fabp mRNA and hnRNA transcripts for the four sets of duplicated fabp genes was determined by reverse transcription, quantitative polymerase chain reaction (RT-qPCR). The level of hnRNA coded by a gene is an indirect estimate of the rate of transcriptional initiation of that gene. Clofibrate increased the steady-state level of fabp mRNAs and hnRNAs for both the duplicated copies of fabp1a/fabp1b.1, and fabp7a/fabp7b, but in different tissues. Clofibrate also increased the steady-state level of fabp10a and fabp11a mRNAs and hnRNAs in liver, but not for fabp10b and fabp11b. Some duplicated fabp genes have, most likely, retained PPREs, but induction by clofibrate is over-ridden by an, as yet, unknown tissue-specific mechanism(s). Regardless of the tissue-specific mechanism(s), transcriptional control of duplicated zebrafish fabp genes by clofibrate has markedly diverged since the WGD event. In 1970, Ohno  proposed that duplication of individual genes, chromosomal segments or whole genomes plays an important role in genome evolution, provides for increasing organismal complexity and contributes to morphological diversification among vertebrates [2–4]. The role of gene duplicates in generating morphological and functional diversity has been discussed by various researchers (see  and references therein). To our knowledge, Ohno  was the first to suggest possible fates for duplicated genes by the process of either nonfunctionalization or neofunctionalization. Nonfunctionalization of a duplicated gene occurs due to deleterious mutations accumulating in the protein coding region, leading to gene silencing and subsequent loss of one of the duplicate genes from the genome. Ohno  further argued that nonfunctionalization is the common fate of a duplicated gene. Neofunctionalization results from mutations in the protein coding region that gives rise to a novel function for a gene product. If this novel function benefits the organism, the gene will be retained in the genome. With complete genomic DNA sequences becoming increasingly available, it is apparent that a greater proportion of gene duplicates are preserved in genomes than that predicted by Ohno’s model . In light of these observations, Force et al., subsequently elaborated by Lynch and Conery , proposed the duplication-degeneration-complementation (DDC) model. In the DDC model, subfunctionalization is the process by which the functions of the ancestral gene are subdivided between the duplicated genes. Subfunctionalization in the DDC model was proposed as an alternative mechanism to Ohno’s neofunctionalization  to explain the high retention rate of duplicated genes in the genome. Force et al., however, did not exclude neofunctionalization, in which one of the duplicated genes acquires a novel function. In the DDC model, subfunctionalization and neofunctionalization occur by either loss or gain of cis-regulatory elements in the promoters of the duplicated genes. Fatty acid-binding protein (FABP) genes belong to the multigene family of intracellular lipid-binding protein (iLBP) genes that also includes the cellular retinol-binding protein (CRBP) and the cellular retinoic acid-binding protein (CRABP) genes [8–12]. To date, eighteen paralogous iLBP genes, including 12 FABPs, 4 CRBPs and 2 CRABPs have been identified in the animal kingdom. No FABP genes have been found in plants or fungi, leading Schaap et al. to suggest that the first FABP gene emerged after the divergence of animals from plants, some 930–1000 million years ago (mya). About 230–400 mya, the iLBP multigene family was further augmented in teleost fishes by a whole genome duplication (WGD) event early in teleost fish lineage [4, 13–17]. Based on complementary DNA (cDNA) sequence, gene structure, conserved gene synteny with their mammalian, avian and fish orthologs, and spatio-temporal patterns of expression, we have characterized 12 zebrafish fabp genes [18–30]. Of these 12 zebrafish fabp genes, eight (four pairs) fabp1a/fabp1b, fabp7a/fabp7b fabp10a/fabp10b and fabp11a/fabp11b arose as a result of the teleost fish-specific WGD [23, 25, 28, 29]. One pair of duplicated genes, fabp1b.1 and fabp1b.2, is tandemly arrayed on chromosome 8 separated by 3.8 kb of DNA . This duplication, subsequent to the WGD early in the fish lineage, is presumably the result of unequal crossing-over between homologous chromosomes during meiosis. The total number of duplicated genes retained in the zebrafish genome following the WGD event is estimated to be 14-30% [31, 32]. Surprisingly, 73% of the duplicated fabp genes have been retained in the zebrafish genome. Only three zebrafish fabp genes exist as single copies, fabp2 fabp3 and fabp6. Originally, FABPs were named according to their initial tissue of isolation. This nomenclature has become increasingly confusing as some tissues contain more than one FABP, and some FABPs are found in many tissues. As such, we have chosen to use in this paper the nomenclature proposed by Hertzel and Bernlohr e.g., FABP1, FABP2, etc. Although different FABP genes exhibit distinct, but sometimes overlapping, tissue-specific patterns of expression, the tertiary structure of FABP genes and their genomic organization are highly conserved [12, 34, 35]. Almost all FABP/fabp genes, with the exception of the FABP3 gene in desert locust , the fabp1a gene from zebrafish  and fabp11a gene from medaka , consist of four exons of comparable coding capacity separated by three introns of varying sizes between paralogous and orthologous FABP/fabp genes in different species [8, 9, 38–40]. Despite extensive studies on the structure of FABPs, binding properties and in vitro lipid transfer mechanisms, their precise physiological role remains elusive. However, several studies [reviewed in 12] have implicated FABPs in myriad cellular processes that include: (1) binding and sequestering of long-chain fatty acids, bile salts and other hydrophobic ligands; (2) transport of these ligands to intracellular compartments for metabolism and energy production; (3) interaction with other enzyme systems and transport proteins; and (4) transport of fatty acids (FAs) to the nucleus to regulate gene transcription via activation of the nuclear receptors, the peroxisome proliferator-activated receptors (PPARs) (see  and references therein). Currently, our knowledge of the regulatory elements controlling the expression of the FABP genes is limited and based mainly on studies of mammalian FABP genes and one FABP gene in desert locust [42–46]. Her et al. [47, 48] cloned the 5' upstream regions, including the basal promoters, of the zebrafish fabp10a and fabp2 genes. They identified a 435 base pairs (bp) region with two distinct liver regulatory elements in the liver-basic fatty acid-binding protein (fabp10a) gene, which is sufficient to modulate liver regional expression in transgenic zebrafish . A 192 bp region was identified in the 5' upstream region of the intestinal-type fatty acid-binding protein (fabp2) gene sufficient to direct intestine-specific expression in zebrafish larval development . Neither of these studies provided insight into why both duplicated fabp10 genes, fabp10a and fabp10b, were retained in the zebrafish genome, or why a copy of the duplicated fabp2 gene was lost from the zebrafish genome following the WGD in the teleost fishes. In previous studies, we have shown that transcriptional initiation of only one copy in each of three sets of duplicated fabp genes of zebrafish, fabp1a/fabp1b.1/fabp1b.2, fabp7a/fabp7b and fabp11a/fabp11b, is modulated by dietary FAs in a given tissue . Since FAs are known to be ligands of PPARs that leads to transcriptional up-regulation of target genes, we anticipated that the transcriptional modulation of fabp genes in various tissues of zebrafish fed different FAs might be mediated by PPARs. The goal of the present research was, therefore, to investigate whether the duplicated fabp genes in zebrafish are differentially regulated by PPAR, by using clofibrate, a PPAR agonist. Clofibrate has been used extensively to investigate the regulation of gene transcription in vertebrates, owing to its specific binding with PPARα, and to a lesser extent to PPARγ, and its effect on the transcription of specific genes involved in lipid metabolism [50–57]. We assayed the steady-state levels of fabp mRNA and heterogeneous nuclear RNA (hnRNA) transcripts for four sets of duplicated fabp genes, fabp1a/fabp1b.1/fabp1b.2, fabp7a/fabp7b, fabp10a/fabp10b and fabp11a/fabp11b in zebrafish fed different concentrations of clofibrate to determine if clofibrate induced transcriptional initiation of only one of a pair of duplicated fabp genes. We show here, however, that clofibrate induced the transcriptional initiation of both pairs of some duplicated fabp genes in zebrafish, but the induction is differentially regulated by an, as yet, unknown tissue-specific mechanism(s). Peroxisome proliferators, such as clofibrate, are known to cause a marked proliferation of peroxisomes in the hepatocytes of animals [58–65]. Proliferation of peroxisomes is also associated with a predictable pleiotropic response, characterized by hepatomegaly, and the increased steady-state level of mRNAs coding for peroxisomal enzymes . In this study, we first wished to determine if clofibrate acts as a peroxisome proliferator in zebrafish as vertebrate species show different responses to clofibrate as assayed by peroxisome proliferation or induction of steady-state transcript levels for several clofibrate-responsive genes. Rats and mice are more responsive to clofibrate than hamsters and humans [66, 67], while some fish, such as medaka and rainbow trout, show little response , and sea bass is essentially refractory to clofibrate treatment . The number of peroxisomes was higher in hepatocytes of zebrafish fed ≥ 0.75% clofibrate (Figure 1B) compared to livers of zebrafish not fed clofibrate (Figure 1A). 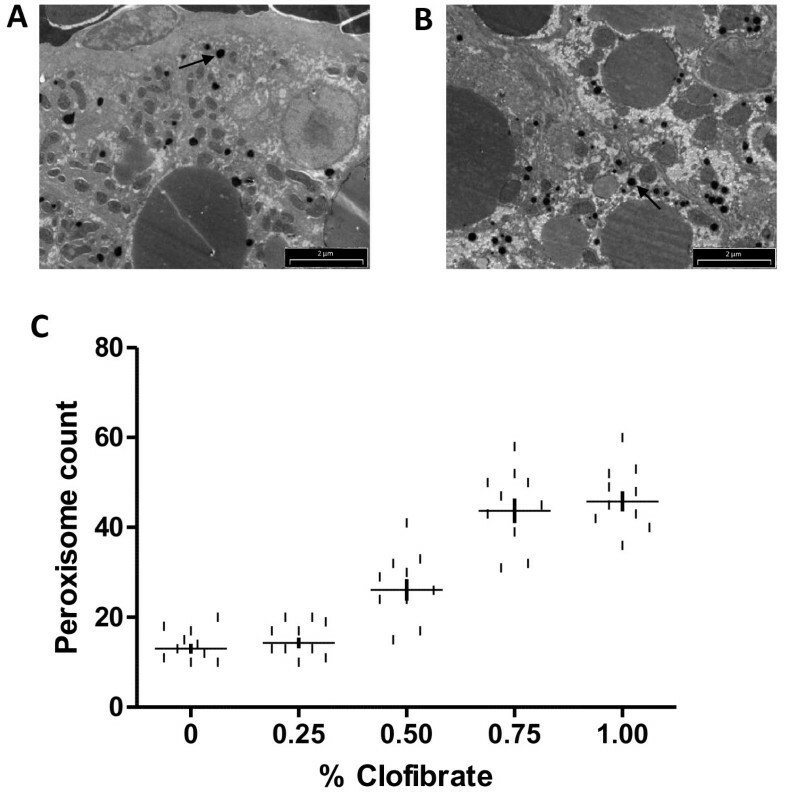 The number of peroxisomes in liver increased 4-fold in zebrafish fed ≥ 0.75% clofibrate compared to the control (Figure 1C). The peroxisomal numbers in intestine did not change with clofibrate treatment, whereas, in other tissues like muscle, brain and heart, we could not observe any peroxisomes (data not shown). Previous studies in rats and mice fed clofibrate showed an increase in the number of mitochondria in the liver [69–71]. 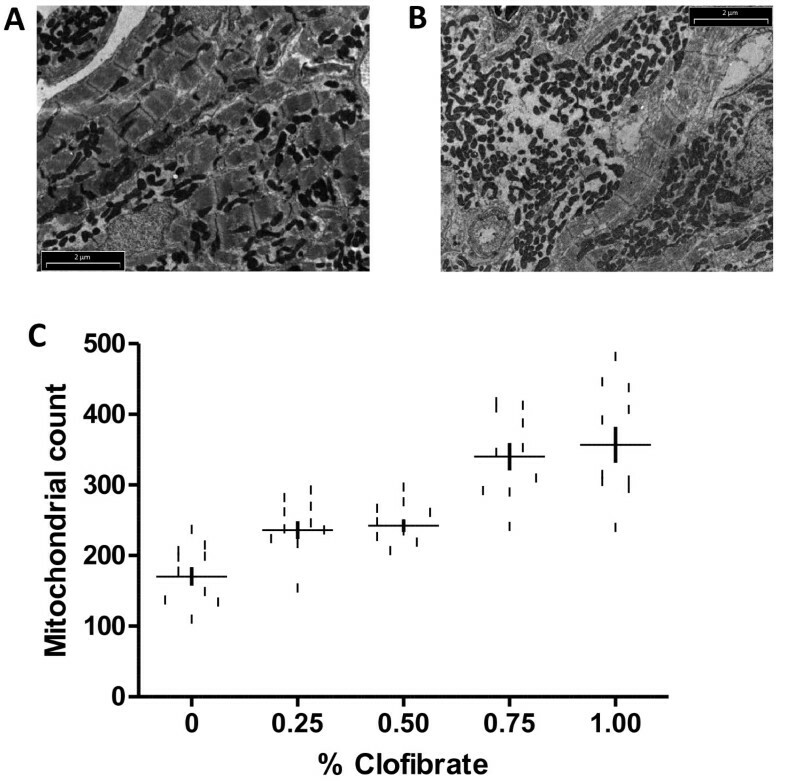 In this study, zebrafish fed ≥ 0.75% clofibrate showed an increase in the number of mitochondria only in heart cells (Figure 2B) compared to the control (Figure 2A). The number of mitochondria in heart cells increased 2-fold in zebrafish fed ≥ 0.75% clofibrate compared to the control (Figure 2C). The mitochondrial number in other tissues (liver, intestine, muscle and brain) examined did not change in zebrafish fed clofibrate. Electron micrographs of hepatocytes of zebrafish after clofibrate treatment. Staining of peroxisomes in the hepatocytes of zebrafish fed 0% clofibrate (A) and 1.00% clofibrate (B). Number of peroxisome per field of view in liver increased with increasing concentration of clofibrate fed zebrafish (C). Arrows point to peroxisomes. Bar = 2 μm. Electron micrographs of heart cells of zebrafish after clofibrate treatment. Mitochondria in the heart cells of zebrafish fed 0% clofibrate (A) and 1.00% clofibrate (B). Number of mitochondria per field of view in heart increased with increasing concentration of clofibrate fed zebrafish (C). Bar = 2 μm. Clofibrate has been widely used in vertebrates to activate PPARα, and in some instances PPARγ, to induce transcriptional initiation of genes involved in lipid homeostasis, such as the acyl-CoA oxidase 1 (Acox1) gene, a gene that contains a peroxisome proliferator response element (PPRE) [52, 65, 72, 73]. In rats, transcriptional initiation of PPARα-responsive genes are up-regulated in the liver, moderately up-regulated in the small intestine and to a lesser extent up-regulated in other tissues, such as skeletal muscle, heart and kidney by clofibrate . The level of Acox1 mRNA in liver, heart, kidney, duodenum and jejunum is increased in rats fed clofibrate compared to controls, but not in ileum and brain . Clofibrate was also shown to increase the level of Acox1 mRNA in liver of chicken , liver and adipose tissue of pigs , hepatocytes of rainbow trout  and liver of rats . 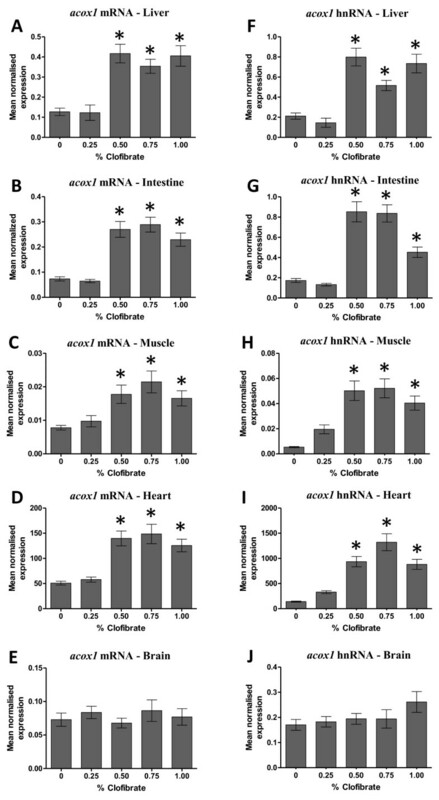 In this study, the steady-state level of acox1 mRNA increased 3-fold in liver (Figure 3A), 3-fold in intestine (Figure 3B), 2-fold in muscle (Figure 3C) and 2.5-fold in heart (Figure 3D) of zebrafish fed ≥ 0.50% clofibrate compared to zebrafish fed < 0.50% clofibrate. The steady-state level of acox1 mRNA and hnRNA in various tissues of zebrafish fed clofibrate. The level of mRNA and hnRNA of the acox1 gene in liver (A, F), intestine (B, G), muscle (C, H), heart (D, I) and brain (E, J) was determined by RT-qPCR using gene-specific primers. The steady-state level of acox1 transcripts was normalized to the steady-state level of rpl13α transcripts in the same sample. Data are presented as the mean ratio ± S.E.M. Significant differences (p < 0.05) in the relative steady-state level of acox1 mRNA and hnRNA between zebrafish [n = 12, (male = 6, female = 6)] fed different concentrations of clofibrate compared to zebrafish not fed clofibrate are indicated by an asterisk. To determine if the increased levels of acox1 mRNA transcripts by clofibrate in various tissues was due to an increased rate of transcriptional initiation, we assayed the steady-state level of hnRNA coded by the acox1 gene. The level of hnRNA for a given gene is an indirect estimate of the rate of transcriptional initiation for that gene as the processing of hnRNA to mRNA occurs rapidly . Zebrafish acox1 hnRNA increased 2.5-fold in liver (Figure 3F), 2-fold in intestine (Figure 3G), 8-fold in muscle (Figure 3H) and 4-fold in heart (Figure 3I) of fish fed ≥ 0.50% clofibrate compared to zebrafish fed < 0.50% clofibrate indicating an increase of transcriptional initiation of the acox1 gene in these tissues. In brain, acox1 mRNA and hnRNA levels did not change in zebrafish fed clofibrate (Figure 3E3J). The lack of affect on the level of acox1 transcripts in the brain of zebrafish fed clofibrate may be due to: (i) clofibrate does not cross the blood brain barrier, or (ii) if clofibrate does cross the blood brain barrier, the acox1 gene is not induced by clofibrate in the brain of zebrafish. The increased number of peroxisomes and mitochondria in the liver and heart, respectively, and the induction of the transcriptional initiation of the acox1 gene by clofibrate in liver, intestine, muscle and heart is compelling evidence that zebrafish is responsive to this peroxisome proliferator, like many other vertebrates [58–72, 75]. Some mammalian FABP genes are induced by various FAs and peroxisome proliferators, and molecular mechanisms for their induction have been proposed [46, 76–80]. FABPs transport long-chain FAs from the cytoplasm to the nucleus [80, 81]. Inside the nucleus, FABPs transfer their long-chain FAs to nuclear receptors, such as PPARα and PPARγ [82–84]. Dietary long chain FAs and peroxisome proliferators activate these nuclear receptors, and once activated, these nuclear receptors form heterodimers with retinoic-acid receptors (RAR) or retinoid X receptors (RXR) (e.g., PPAR-RAR and PPAR-RXR), which in turn bind to response elements in FABP genes, and thereby, stimulate initiation of transcription [85–91]. Previous reports have shown that FAs and peroxisome proliferators increase the steady-state level of L-FABP (FABP1) and I-FABP (FABP2) gene transcripts in the mammalian liver and small intestine [43, 76, 77, 79, 92, 93]. Peroxisome proliferators also increase the transcriptional activity of A-FABP (FABP4) in adipocytes of mice [46, 84]. In this study, the steady-state level of fabp1a mRNA increased 1.5-fold in the intestine of zebrafish fed 0.50% and 0.75% clofibrate (Figure 4A) and increased 4-fold in muscle of zebrafish fed 0.50% clofibrate compared to zebrafish not fed clofibrate (Figure 4E). In heart cells of zebrafish fed ≥ 0.75% clofibrate, fabp1b.1 mRNA increased 2-fold compared to zebrafish not fed clofibrate (Figure 4J). To determine if the increased levels of fabp1a mRNAs was the result of transcriptional initiation, we assayed the levels of hnRNA for these fabp genes in various tissues of zebrafish. The steady-state level of fabp1a hnRNA increased 6-fold in intestine of zebrafish fed ≥ 0.50% clofibrate (Figure 4D) and > 5-fold in muscle of zebrafish fed 0.50% clofibrate (Figure 4H). In zebrafish fed ≥ 0.50% clofibrate, the level of fabp1b.1 hnRNA in heart increased 3-fold compared to zebrafish fed the control diet. (Figure 4L). The levels of fabp1a mRNA in heart (Figure 4I), fabp1b.1 mRNA in intestine (Figure 4B), fabp1b.1 mRNA in muscle (Figure 4F), fabp1b.2 mRNA in intestine (Figure 4C), fabp1b.2 mRNA in muscle (Figure 4G) and fabp1b.2 mRNA in heart (Figure 4K) remained unchanged in zebrafish fed clofibrate. The steady-state level of fabp1a/fabp1b.1/fabp1b.2 mRNA and hnRNA in intestine (A, B, C, D), muscle (E, F, G, H) and heart (I, J, K, L) of zebrafish fed clofibrate. The level of mRNA and hnRNA was determined by RT-qPCR using gene-specific primers. The steady-state level of fabp transcripts was normalized to the steady-state level of rpl13α transcripts in the same sample. Data are presented as the mean ratio ± S.E.M. Significant differences (p < 0.05) in the relative steady-state level of fabp mRNAs between zebrafish [n = 12, (male = 6, female = 6)] fed different concentrations of clofibrate compared to zebrafish not fed clofibrate are indicated by an asterisk. Duplicated copies of zebrafish fabp7 (fabp7a and fabp7b) exhibited distinct tissue-specific patterns of up-regulation by clofibrate of levels of both mRNA and hnRNA (Figure 5). fabp7a mRNA increased > 7-fold in liver of zebrafish fed 0.50% clofibrate (Figure 5A) and > 2-fold in intestine of zebrafish fed 1.00% clofibrate (Figure 5D), while fabp7b mRNA levels increased 6-fold only in muscle of zebrafish fed ≥ 0.50% clofibrate compared to zebrafish not fed clofibrate (Figure 5H). The steady-state level of fabp7a/fabp7b mRNA and hnRNA in liver (A, B, C), intestine (D, E, F) and muscle (G, H, I) of zebrafish fed clofibrate. The level of mRNA and hnRNA was determined by RT-qPCR using gene-specific primers. The steady-state level of fabp transcripts was normalized to the steady-state level of rpl13α transcripts in the same sample. Data are presented as the mean ratio ± S.E.M. Significant differences (p < 0.05) in the relative steady-state level of fabp mRNAs between zebrafish [n = 12, (male = 6, female = 6)] fed different concentrations of clofibrate compared to zebrafish not fed clofibrate are indicated by an asterisk. The increase in the mRNA levels of zebrafish fabp7 genes correlated with the increase in the levels of their hnRNA. fabp7a hnRNA increased > 3-fold in liver of zebrafish fed 0.50% clofibrate (Figure 5C) and 7-fold in intestine of zebrafish fed ≥ 0.75% clofibrate (Figure 5F), while fabp7b hnRNA increased 6-fold in muscle of zebrafish fed ≥ 0.50% clofibrate (Figure 5I) compared to control zebrafish. No change was observed in the levels of fabp7b mRNA transcripts in liver (Figure 5B) and intestine (Figure 5E), and fabp7a mRNA in muscle (Figure 5G) in zebrafish fed clofibrate. The steady-state level of fabp10a mRNA increased > 2-fold in liver of zebrafish fed 0.50% clofibrate compared to control (Figure 6A), whereas the level of fabp10b mRNA (Figure 6B) did not change in the liver of zebrafish fed clofibrate. A 3-fold increase of fabp10a hnRNA mirrored the increase of mRNA coded by this gene in liver of zebrafish fed 1.00% clofibrate compared to control zebrafish (Figure 6C). The steady-state level of fabp10a/fabp10b mRNA and hnRNA in liver (A, B, C) and fabp11a/fabp11b (mRNA and hnRNA) in liver (D, E, F) of zebrafish fed clofibrate. The level of mRNA and hnRNA was determined by RT-qPCR using gene-specific primers. The steady-state level of fabp transcripts was normalized to the steady-state level of rpl13α transcripts in the same sample. Data are presented as the mean ratio ± S.E.M. Significant differences (p < 0.05) in the relative steady-state level of fabp mRNAs between zebrafish [n = 12, (male = 6, female = 6)] fed different concentrations of clofibrate compared to zebrafish not fed clofibrate are indicated by an asterisk. 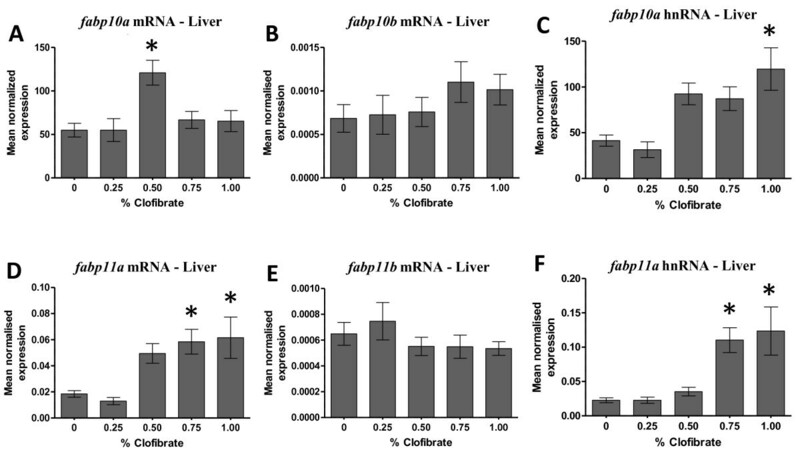 The steady-state level of fabp11a mRNA (Figure 6D) increased 3-fold in liver of zebrafish fed ≥ 0.75% clofibrate compared to control, but the steady-state level of fabp11b transcripts (Figure 6E) did not change in the liver of zebrafish fed clofibrate. Similarly, fabp11a hnRNA increased > 4-fold in liver of zebrafish fed ≥ 0.75% clofibrate compared to control (Figure 6F). No difference in the steady-state level of any fabp mRNA and hnRNA assayed was observed between male and female zebrafish (data not shown). We report here that zebrafish fed clofibrate exhibited distinct patterns of up-regulation of the steady-state level of mRNAs of duplicated fabp genes (Table1). None of the levels of fabp mRNA transcripts assayed changed in the brain of zebrafish fed clofibrate (data not shown). Furthermore, changes in the levels of mRNA for a specific fabp gene were directly correlated with changes in the steady-state level of hnRNA for that particular fabp gene indicating that clofibrate induced transcriptional initiation of zebrafish fabp genes (Table1). Clofibrate induction of some zebrafish fabp genes appears, however, to be controlled by a tissue-specific mechanism(s), as induction of the steady-state level of fabp mRNAs and hnRNAs by clofibrate was seen for both duplicated copies of fabp1a/fabp1b.1, and fabp7a/fabp7b, but in different tissues. Clofibrate also increased the steady-state level of fabp10a and fabp11a mRNAs and hnRNAs in liver, but not for fabp10b and fabp11b. +, increase relative to control. -, no change relative to control. Based on in silico analyses, we found that most zebrafish fabp genes contain putative PPREs within 7 kilobase pairs (kb) of DNA upstream of the transcriptional initiation site of each fabp gene (data not shown). Since functional PPREs that activate gene transcription via peroxisome proliferators have also been found in introns [73, 94], we screened the intronic sequences of each of the zebrafish fabp genes described in this paper for PPREs. Many of these fabp genes contained putative PPREs in their introns (data not shown). While in silico analyses can be very useful in determining the direction of future experimental work, the results of in silico analyses must be interpreted cautiously. To illustrate this cautionary point, in silico analysis of the rat peroxisomal thiolase B gene identified a putative PPRE in the promoter region of this gene that did not bind PPARα in vitro, but subsequent studies showed that a functional PPRE in intron 3 of this gene did bind an activated PPARα in vitro. To demonstrate that the putative PPREs we have found by in silico analysis in the various zebrafish fabp genes are indeed functional will require studies involving deletion of PPREs and/or site directed mutation of putative PPRE sequences in the fabp promoters and introns to demonstrate loss of function in various cell culture lines and transgenic zebrafish. If functional PPREs are identified in the zebrafish fabp genes, the most parsimonious explanation of the tissue-specific differential induction of transcriptional initiation of the duplicated zebrafish fabp1a/fabp1b.1 and fabp7a/fabp7b genes by clofibrate is that both duplicated copies of these gene have retained a functional PPRE, but that induction by clofibrate is over-ridden by an, as yet, unknown tissue-specific mechanism(s). An alternative explanation is that induction of fabp transcriptional initiation by clofibrate is mediated via an indirect mechanism wherein the induction of fabp genes occurs by an intermediate or “upstream” gene activated by PPAR coding for a transcription factor, which in turn activates zebrafish fabp genes. Again, however, this indirect induction of fabp gene transcription by clofibrate-activated PPAR must be mediated by an over-riding tissue-specific mechanism(s). Whether clofibrate-induced transcription of zebrafish fabp genes is the result of clofibrate-activated PPAR directly at a fabp PPRE or indirectly via an “upstream” gene coding for a regulatory protein, the regulatory DNA elements in the duplicated fabp genes have certainly diverged markedly since the WGD event ~230-400 million years ago [4, 13–17], thereby supporting the DDC model [6, 7] for the retention of these duplicated fabp genes in the zebrafish genome. Experimental diets containing five different concentrations (0, 0.25, 0.50, 0.75 and 1.00% w/w) of clofibrate (Sigma-Aldrich, Oakville, Ontario, Canada) were formulated (Table2). Clofibrate concentrations and basic feed formulation were based on previous dietary studies [57, 95–97] and the United States National Research Council’s nutrient requirement recommendations for warm-water fishes . The dry ingredients were mixed using a Hobart mixer for 20 min. Choline chloride was dissolved in distilled water and clofibrate mixed in corn oil prior to addition to dry ingredients. Boiling water was added to the dry ingredients to make wet dough (40% v/v). The dough was spread on tray and freeze-dried for 36–48 h. The freeze-dried diet was then passed through a 0.8 mm mesh to yield particles of less than 800 μm, which were then stored at −20°C. a US Biochemical. (Cleveland, OH, USA). b Dover Mills Ltd. (Halifax, NS, Canada). c Sobeys Inc. (Halifax, NS, Canada). d Corey Feeds Ltd. (Fredericton, NB, Canada). e National Starch and Chemical Co. (Bridgewater, NJ, USA). f Vitamin added to supply the following (per kg diet): vitamin A, 8000 IU; vitamin D3, 4000 IU; vitamin E, 300 IU; menadione sodium bisulfite, 40 mg; Thiamine HCl, 50 mg; riboflavin, 70 mg; d-Ca pantothenate, 200 mg; biotin, 1.5 mg; folic acid, 20 mg; vitamin B12, 0.15 mg; niacin, 300 mg; pyridoxine HCl, 20 mg; ascorbic acid, 300 mg; inositol, 400 mg; choline chloride, 2000 mg; butylated hydroxy toluene, 15 mg; butylated hydroxy anisole, 15 mg.
g Mineral added to supply the following (per kg diet): manganous sulphate (32.5% Mn), 40 mg; ferrous sulphate (20.1% Fe), 30 mg; copper sulphate (25.4% Cu), 5 mg; zinc sulphate (22.7% Zn), 75 mg; sodium selenite (45.6% Se), 1 mg; cobalt chloride (24.8% Co), 2.5 mg; sodiumfluoride (42.5% F), 4 mg.
h Betaine anhydrous (96% feed grade). (Finnfeeds, Finland). i Sigma-Aldrich Inc. (St. Louis, MO, USA). To reduce genetic variance, four female and two male adult zebrafish of the AB strain , obtained from the Aquatron at Dalhousie University, were bred in a single tank to produce embryos. Embryos, larvae and adult fish were maintained in aerated water at 28.5°C on a 14 h light and 10 h dark cycle . One hundred and fifty day-old zebrafish were acclimatized in 35 L aquaria for four weeks prior to feeding fish diets containing clofibrate. Three replicates of five different dietary groups of fish were distributed in 15 tanks in a randomized complete block design. Each tank contained 15 zebrafish. Fish in each tank were maintained under the same light intensity and photoperiod. After acclimatization for a week, fish were fed the experimental diets twice a day to satiation. At the end of four weeks, fish were anaesthetized by immersion in a solution of 0.20% (v/v) MS-222 prior to tissue dissection. Dissection of fish was done on ice. From each fish, liver, intestine, muscle, brain and heart were removed. All experimental protocols were approved by the Dalhousie University Committee on Laboratory Animals in accordance with the recommendations of the Canadian Council on Animal Care. Tissue samples (liver, intestine, muscle, brain and heart) from 0, 0.25, 0.50, 0.75 and 1.00% (w/w) clofibrate-fed fish were dissected and transferred to centrifuge tubes containing 2% glutraldehyde fixative (osmolarity ~300 mOsm) for 30–40 min on ice . The tissue samples were subjected to three 10-minute washes in 0.1 M cacodylate buffer. The samples were transferred to 0.1 M Tris–HCl buffer and washed twice for 10 min. The samples were pre-incubated in 1% diaminobenzidine (DAB) solution for 30 min at 37°C with shaking. Ten μl of 30% hydrogen peroxide solution was added and the samples were incubated for 20–30 min at 37°C with shaking. Tissues were washed in 0.1 M TBS for 10 min and transferred to centrifuge tubes and subjected to three 10-minute washes with 0.1 M cacodylate buffer at room temperature . Finally, the tissues were post-fixed in 1% osmium in 0.1 M cacodylate buffer for 1 h at 4°C and washed in filtered, deionized H2O for 15 min. Tissues were dehydrated for transmission electron microscopy, infiltrated overnight and later embedded in epon resin . Ten electron microscopy images of tissues for peroxisomes and mitochondria were counted in tissues of adult zebrafish fed different concentrations of clofibrate. Total RNA was extracted from adult zebrafish tissues using TRIzol (Invitrogen, Carlsbad, CA, USA) according to the protocol recommended by the supplier. The quality and quantity of extracted RNA was assessed by agarose gel-electrophoresis and spectrophotometry at 260 nm, respectively. cDNA was synthesized from mRNA using an oligo (dT) primer according to the manufacturer’s protocol for the omniscript RT kit (Qiagen, Mississauga, Canada). cDNA was synthesized from hnRNA using random hexamers. Primer sequences for the quantification of mRNA and hnRNA encoded by different fabp genes and their annealing temperature (AT) for primer pairs of each fabp gene during PCR are shown in Table3. To assay specific hnRNAs, one primer was complementary to an intronic sequence, while the other was complementary to an exonic sequence. acox1, a gene known to be induced by clofibrate in many organisms [52, 72] was used as a positive control. Amplification of cDNA samples and DNA standards was carried out using the QuantiTect SYBR Green PCR Kit (Qiagen, Mississauga, Ontario, Canada) following the manufacturer's instructions. For thermal cycling and fluorescence detection, a Rotor-Gene 3000 system (Corbett Research, Sydney, Australia) was used. PCR conditions were: initial hold for 15 min at 95°C followed by 40 cycles of 15 s denaturation at 94°C, 20 s annealing of primers at different temperatures depending on the primer pairs (see Table3), and 30 s of elongation at 72°C. Following completion of the PCR cycles, the melting temperature of the PCR product was determined as an indication that total fluorescence was derived from a single gene-specific product. Fluorescence was measured following each cycle. The copy number of mRNA and hnRNA for each fabp gene was determined using the standard curves as explained by Bustin et al.. As negative controls, reverse transcriptase was omitted from cDNA synthesis reactions for each sample and these controls were subjected to quantitative PCR. To determine the relative steady-state level of fabp mRNA and hnRNA transcripts in each tissue, the absolute copy number of fabp mRNA and hnRNA transcripts was divided by the copy number of ribosomal protein large subunit 13α (rpl13α)  mRNA and hnRNA transcripts in each sample. Statistical analyses were performed using the GraphPad PRISM® software version-5 (San Diego, California, USA). Data were analyzed using one-way analysis of variance (ANOVA). Post hoc comparisons were conducted using the Tukey’s Multiple Comparison Test. The level of significance was chosen at p < 0.05 and the results were presented as means ± S.E.M. ABV and JMW conceived and designed the studies. ABV carried out the experimental work and statistical analysis. SPL assisted in the formulation of zebrafish diet. EMD-W assisted in design and interpretation of RT-qPCR analysis. ABV and JMW drafted the manuscript. All authors read and approved the final version of the manuscript. Reverse transcription-quantitative polymerase chain reaction. We thank Valarmathy Kaliaperumal for technical assistance during fish dissection and RNA isolation, Zhiyuan Lu for preparing the electron microscopy slides, and Sean Tibbets for help in preparation of diets fed zebrafish. This work was supported by funds from the Natural Sciences and Engineering Research Council of Canada (to JMW), National Research Council of Canada (to SPL), Canadian Institutes of Health Research and the Nova Scotia Health Research Foundation (to EMD-W). ABV is a recipient of a Faculty of Graduate Studies Scholarship from Dalhousie University.